After traveling for three very long months and visiting a grand total of 18 cities in India, we finally prepared to depart from Ladakh, and Mother India herself. But before we go, let me share with you a story from our last meal with our Ladakhi hosts, and a photo tour of the stunning Shanti Stupa, a Japanese temple built in 1991. It’s a fitting last spot to visit since the panoramic vista of the Himalayans offers a sweet goodbye. 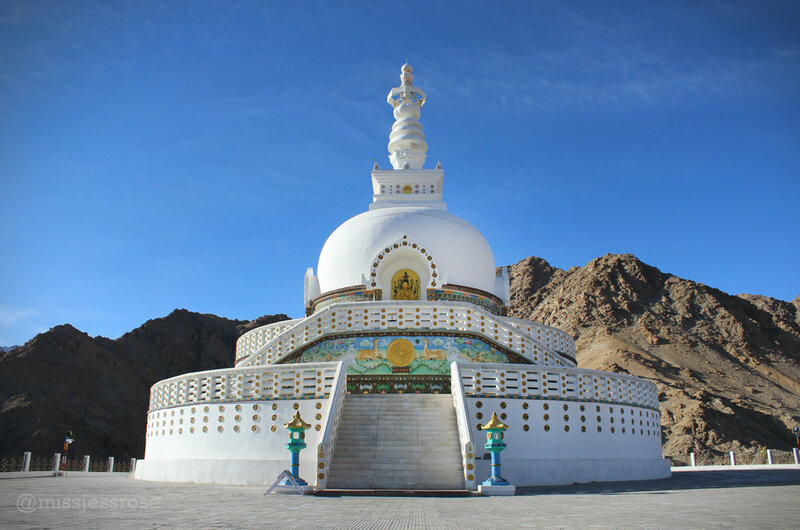 Shanti Stupa sits atop a mountain peak overlooking the village of Leh, and was built to promote world peace in conjunction with commemorating 2,500 years of Buddhism as a religion. Today, people from all over the world come to visit. Shanti means peace, calm, tranquility or bliss. After visiting the Stupa, we returned to our guest house for one last dinner of homemade momos followed by hot tea. We leisurely chatted with our host, recounting favorite experiences from our two week stay in Leh. I had grown to love our meandering conversations about life, jobs and other shared worries or joys. On this particular night, our host spoke about a longtime friend from Switzerland who visits Leh regularly. He shared her perspective. He explained that each time she visits Ladakh, she is surprised all over again. People here are so peaceful, calm, and welcoming, she observes. I've found this to be true, too. It’s normal for Ladakhis to eat dinner each night together as a family, and to spend hours in the evening talking, just as we are now. It’s normal to walk about the village with a prayer wheel, and to greet each person you pass with eye contact and a friendly “juleh!" Our host smiles and says, it’s strange to him that such behavior is unfamiliar for a Westerner. What must it be like in Europe, or in America then, if people aren’t peaceful and kind? What do people do if they don't eat dinner together as a family? Our host went on to say that Westerners must be deeply stressed on the inside. They are frantic, and hurried, and often miss the peaceful joys of life. Westerners rarely take time to live a slow lifestyle in the same way as Ladakhis, failing to spend time with family and to unplug from the distracting weight of work. Those Westerners who come to visit Leh wear their name-brand puffy coats, and tote their fancy new camera equipment, smart phones and laptops. They appear rich, he says, at least in comparison to many of the locals. But on the inside, he says, these Westerners are “not good,” filled with toxic problems and the burden of continual stress and depression. In other words, Westerners have a chronic malaise. I think he is not so wrong. Our conversation gets me thinking about what we value together as a culture in the West. Of course we are currently facing exceptionally harrowing times, especially in the U.S., but it’s my hope that collectively we can shift our definition of progress and our perspective about what really matters in life. There are enough people starting to talk about such problems more urgently. Maybe we can work towards sharing a little bit more of this Ladakhi peace. Maybe together, we can become a bit more self-aware of the pressure we put on ourselves, and lighten up a little bit so that we can spread more awareness and kindness. What do you think? 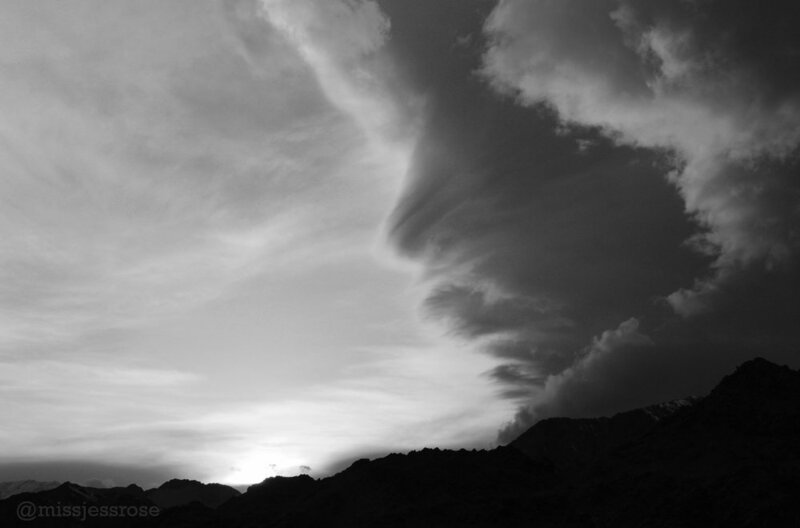 Dramatic clouds roll in as the sun begins to set behind the Himalayan Mountains.